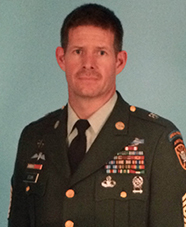 Army Master Sergeant Robert Sturk first enlisted in the Army in November of 1987 at the age of 18 out of Mason, Ohio because he wanted to defend his country and give himself a greater purpose. His service lasted 23 years before he retired in June of 2011. Master Sergeant Sturk was first injured when he damaged his back in rappelling incident in Colombia earlier in his service. His most serious and career ending injury was in a motorcycle accident in Fort Bragg, North Carolina in January 2007 when he was traveling home. The accident put him in a coma for a month. He suffers from a severe traumatic brain injury, memory loss, visual seizures, left arm atrophy and chronic pain from injuries to his neck, lower spine, hip and throat. His service to his country earned Master Sergeant Sturk dozens of commendations, including four Meritorious Service Medals, four Army Commendation medals, two Joint Service Achievement Medals, the Meritorious Unit Commendation, six Army Good Conduct Medals, two National defense Service Medals, the Armed Forces Expeditionary Medal, the Southwest Asia Service Medal with two bronze Service Stars, the Global War on terrorism Expeditionary Medal, Global War on Terrorism Service Medal, Humanitarian Service Medal, three Non- Commissioned Officer Professional Development Ribbons, the Army Service Ribbon, Over-seas Service Ribbon, Combat Infantryman Badge, Expert Infantryman Badge, the Special Forces Tab, and Parachutist Badges from the U.S., United Kingdom, Colombia, Guatemala and Paraguay. Master Sergeant Sturk and his wife will receive a mortgage-free home in Sarasota, Florida. Click here to download the homecoming flyer!